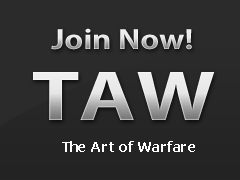 Forums » TAW Games - Public Forums » War Thunder » War Thunder - Training Event - Blitzkrieg Tanks! A huge thank you to all the NA and EU members who have come along to our weekly training events. To see so many turning out and giving positive feedback is really encouraging! Blitzkrieg Tanks - The Fast and The Furious! This time we are back in our tanks, where our Instructor - Gunnery Sergeant Rexmaster - will be showing how the Blitzkrieg tactics from WWII can be used to devastating effect in our games of War Thunder. So rev the engines, pour nitrous in the tanks, and get ready for some speed!